Mrs. Gayatri Gupta is an alumna of Sri Sathya Sai Institute of Higher Learning, Anantapur Campus, where she earned her Masters in English in 1985. She comes from a family associated with Bhagwan Baba since 1945, when Baba was merely 19 years old. Her family is well known in Sai circles as the Kuppam family. Four generations of Gayatri’s family tree have been devoted to Bhagawan Baba and this rich lineage has a treasure trove of divine experiences. Radio Sai is pleased to bring you select excerpts of her conversation with Radio Sai’s Karuna Munshi, which was recorded as part of our series Fleeting Moments Lasting Memories. RS (Radio Sai): Sai Ram Gayatri and welcome to Radio Sai! Tell us, how did your ancestors come to know of Swami that early in Kuppam, in Chittoor district, Andhra Pradesh, which is a considerable distance from Puttaparthi? GG (Gayatri Gupta): It’s just 100 miles away. RS: But in those days, when lines of communication and roads were very poor, I think 100 miles was a considerable distance. So how did they hear of Baba? GG: It was not an obstacle at all for the Kuppam family. They used to travel all the way from Kuppam from 1945 in bullock carts, sometimes carrying their luggage on their heads or shoulders and trying to jump over the stones and cross the rivers… do everything…. to have the darshan and to be close with Swami. 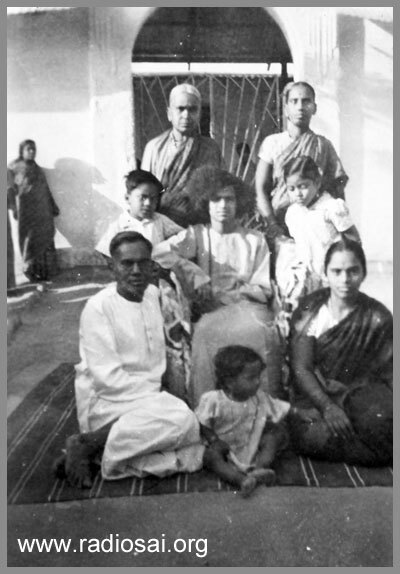 Swami with the fortunate Kuppam family. Seated down on either side of Swami is Kuppam Radhakrishnan and Radhamma. Kneeling down on either side of Swami is 'Amba' (to His left) and 'Kichachi'. Seen standing behind Swami is Vijayamma (author of 'Anyatha Sharanam Nasti'), to her right is Mrs. Gayatri's mother Sarala and aunt Prema. RS: Wow! That was rather quick. GG: That was the thing Swami declared first and it made an everlasting impression on them. They started making frequent visits. During all these trips, grandma used to prepare many food items like hot dosas, uppitu (upma) and ragi laddoos (sweet balls made of finger millet). Swami used to love the ragi laddoos! Though the family was not very financially sound, it did not stop them from rushing to Puttaparthi at every opportunity. There are so many miracles but one of the most memorable one was the resurrection of my grandfather, how he was brought back to life. In fact, it was a rebirth. It so happened that my grandfather passed away and grandma stood like a modern-day Satyavan Savitri (Savitri had brought her husband back from the clutches of Lord Yama, the God of Death). This happened in Puttaparthi. It was almost three days since my grandpa had died. The body had swollen. 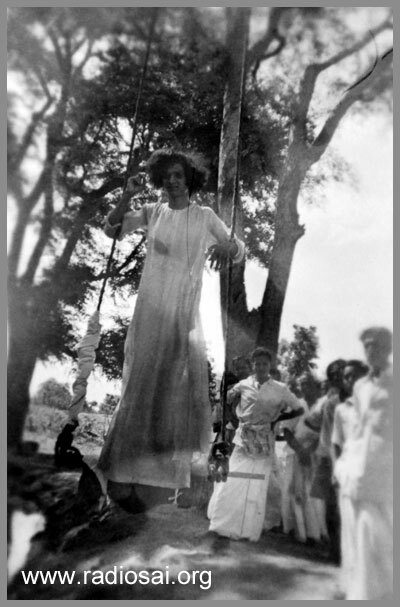 There were so many critics who were making satirical remarks about the supernatural powers of Swami. They said, ‘What? You expect this young man to get your husband back to life? Never. Will they allow you to take the body to Swami?” But, grandma stubbornly stood with fervent faith and told them that until and unless Swami gave His instruction for the body to be removed, she would not budge from the place. Seated on the floor, on either side of Swami is Kuppam Radhakrishnan and Kuppam Radhamma. And then, on the third day, Swami came out from the verandah. He peeped and said “What Radhamma? What are you doing?” He knew everything. Yet, like an innocent child, He asked, “Where is Radhakrishna?” Then He came down the stairs and went to their room. He closed it for a minute and as He opened the doors, my grandfather was sitting straight on the bed, sipping a cup of fuming coffee served by Swami! Grandpa asked, “What Swami, what are you doing here? Why are you here?” And Swami very sweetly replied, “Oh, you’ve come back? Nothing, go ahead and have your coffee.” Hundreds of people, devotees who had gathered there to see what was going to happen, started shouting “Bolo Bhagwan Baba ki Jai”, “You are the Mahatma”, “Mahatma Babaji ki Jai”. They kept on raising slogans and praising Swami so much. That is one of the most memorable miracles which had happened in the life of Kuppam Radhakrishnan. RS: So, instead of a funeral, there was a total resurrection? RS: And this is what we read in the Bible and in the scriptures and here, it happened in your own family. That must have been a huge boost to your faith as an entire family. GG: With this incident, Swami had proved that He was omniscient, omnipresent, and omnipotent. So let me tell you one thing. The bond between the Kuppam family and Swami is not only human but humane – naïve, pure, spotless and genuine. There are innumerable incidents, miracles, leelas, and I would like to share a few. RS: Sure, please, go ahead. GG: So after this incident, slowly, the entire family kept thinking only about Swami and Swami alone. And to tell you the truth, this word ‘Swami’ was first given by the Kuppam family to our beloved Swami. Then the children of Radhamma and Radhakrishna, three daughters, Kuppam Vijayamma, Kuppam Saralamma, Prema and all the four sons, were really taking care of Swami like security guards. Swami had nicknamed each one of them. Amarendra was called as ‘Amba’, Krishnamurthy was called as ‘Kichachi’, and at times, He would shout at him calling him as ‘Pichachi’, which means ‘a demon’. And then my mother and my aunt, Sarala and Prema, were given peculiar nicknames which you wouldn’t have dreamt of like ‘Pakoda’ or ‘Bonda’. He’s so full of humour always and what joy He kindles in everybody’s hearts! I would like to tell one of the few incidents, which brings Ananda and Paramananda (ultimate bliss) even as I recollect. We grandchildren looked forward to our summer and winter holidays to be with grandparents for those special nights when Grandma would call all of us for the moonlight dinner. We were about eight of us and we would encircle her. It would be a very nice, very pious atmosphere in Kuppam. Each one of us would stretch out a hand and grandma used to keep a ball of rice into our palms while we would ask her, “Avvaa, Avvaa, cheppavvaa, Swami Kathalu cheppendavvaa cheppendavvaa” (grandmother, please tell us Swami’s stories). 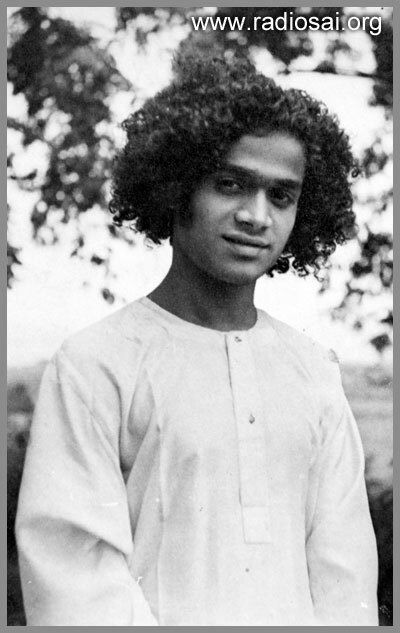 "His hair was not only full of curls … it was very thick..
GG: All about Swami only. Then, she used to say, “Wait…. Listen, I will tell you….. Puttaparthi then was quite different from what you see now. It was a small, remote village almost a forest, a mini-forest. Once you know what happened…. ?” and that’s how it would begin... "Swami used to jump and run into the forest like a deer." GG: His hair was not only full of curls … it was very thick and there was a lovely partition, this complete circle of hair was still not there. RS: There was a parting, right? GG: There was a parting and He looked very charming, my grandmother said. She said Swami used to be a very good sportsman. There were many activities of His in which He Himself used to be involved. The sports event of Swami’s students which takes place in the Hill View Stadium itself proves what a lover of sports Swami is. Swami would conduct many games then. He used to call everybody, all the devotees to the river. He was so fond of River Chitravati. Most of the time, all the devotees would be playing on the banks of the river. Swami used to say: “Come on. Now, I’m going to keep a running race. Whoever comes first will get an extra padanamaskar.” And now for one padanamaskar, we have to pray for years! In those days He used to insist that everybody take padanamaskar. And my uncles, who were very heavily built, felt so reluctant to bend down and take the namaskar. They used to tell Him,” Swami, how many times you expect us to take a namaskar?” Now these were the frank expressions of my uncles. But otherwise, the moment Swami said anything, they would instantly listen. On the sands of Chitravathi with a few children from the Kuppam Family,in early 1940s. Another game He would conduct was racing; whoever ran fastest and reached the Kalpavriksha tree would be the winner. And in no time, it was once again Swami, who was the winner. RS: He would just appear on top! GG: Before the wink of an eye, He would be there. “See, I have reached, I am the first.” Swami loves games. Another wonderful game which Swami used to love was to swing. Those days hard coir ropes were used to draw water from the well. He used to get those ropes, tie them to the top branch of a very well-grown tree and make a jhoola and swing to great heights. Devotees would shout “Swami, enough, enough!” And Swami used to laugh out happily and His joy would reach to such heights. It looked as if He was touching the sky and getting back to the earth… like how an albatross or a pelican just dives deep down into the waters of the sea. He used to spend most of His time on the banks of Chitravati playing all these games. His would be the perfect measurement of His height and He was the winner! “Okay, I will give you another novel idea. Make balls of Tulasis, tie it tightly.” Nowadays we have football, fiber type plastics, etc, but in those days, all these things were not available. Whatever was available was from nature, and Swami made us use it. So, with these tightly tied Tulasi balls, Swami had another new game. He said, “All the men to one side, all the women to another side.” This was a monkey play. And Swami stood in between them and He threw the Tulasi balls to them and they played for a long time. And when all were tired, He would take them to the old Mandir and one would say, “Swami, how come you played with me alone?”, and another would say, “No no, Swami played only with me”, someone else would add, “You played with me only”. I think Swami had made all the devotees touch the peak of Ananda. RS: So, each one thought it was a personalized game for them? He made everybody feel so special. GG: Everyone had a Sai Krishna playing with them, without knowing with whom the other was playing with. Everybody was involved in their own play. RS: And your mother and your mother’s siblings and your grandparents were present during these times? GG: Grandparents were so busy in the Mandir activities – cleaning, making the altar ready for bhajans, because the entire gang would enter all of a sudden into the Mandir and Swami would say, “Come on, start the bhajans.” And everything had to be readied, including the food program. I think for nine months every year, they were in Puttaparthi, enjoying all these activities with Swami. RS: And I think your Aunt Mrs. Vijayakumari’s book ‘Anyatha Sharanam Naasti’ or ‘Other Than You Refuge There is None’, has chronicled all these things that you speak of and many more in a lot of detail. And it’s totally amazing that you heard them as part of the stories you grew up with. The cover of the Telugu book, 'Anyatha Sharanam Naasthi' which was authored by Mrs. Vijayakumari of the Kuppam family. GG: And this book was christened by Swami Himself. Baba had made another declaration. He said this book would become a miracle book in the future. And every devotee should keep a copy of this in the altar, so that they can present all their worries, problems and their sorrows and keep this as a very pious book.